Holocaust survivor David Ben David, one of the last defenders of Kfar Etzion in 1948, passes away at 98. David Ben David, a Holocaust survivor who fought to protect Kfar Etzion during the 1948 War of Independence, passed away Tuesday evening. He was 98. Ben-David fought in Kfar Etzion in 1948, served in the Jewish Brigade, and was captured by the Jordanian army after being wounded in battle when Kfar Etzion fell. 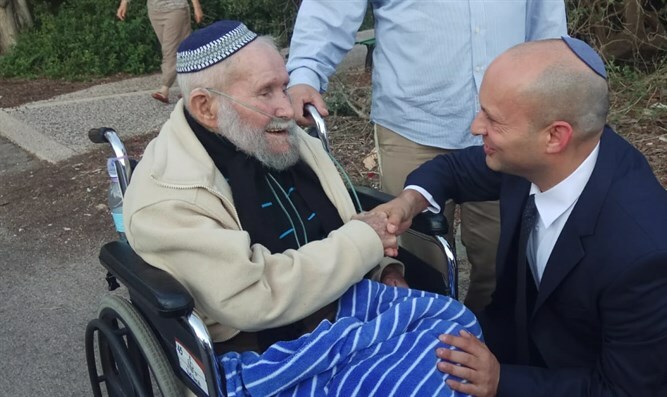 After his return from captivity, he founded together with the survivors of Kfar Etzion the Moshav Nir Etzion south of Haifa, where he lived for the rest of his life. Ben David arrived in Kfar Etzion after the War of Independence and collected the bones of the last fighters of Kfar Etzion. As a defender of Kfar Etzion, Ben David made sure to connect with the Arabs of the area and was in charge of security and guarding the kibbutz lands. As noted, Ben David fought in the ranks of the Jewish Brigade within the framework of the British army during the Second World War. He lit a torch at Yad Vashem marking the 50th anniversary of the end of World War II. The Minister of Education and Chairman of the Jewish Home, Naftali Bennett, called Ben David a "hero of Israel." Bennett said that "David escaped from the Holocaust. He was a great fighter who led Kfar Etzion until he fell into Jordanian captivity. He asked me: "Our enemy is afraid of us?" "Why do you ask?" [I said]. He replied: "Because if the enemy is afraid of us, there will be no war." This is the entire theory of deterrence in one simple sentence: May his memory be for a blessing." Yaron Rosenthal, the director of the Kfar Etzion Field School, wrote "David Ben David's legacy leaves us without one of the pillars of Gush Etzion in the 1940s and turned us all into orphans from one of the spiritual fathers we had." "Despite his age, Ben-David never refused to hold talks and lectures and teach the heritage of 1948 to a team of field school instructors and many trainees," Rosenthal said.